In September of 2006, following a desperately sad childhood that saw both drug-addicted parents murdered and the care of her younger siblings left in her hands, 16-year-old Sacia Flowers decided to write to J. K. Rowling and thank her for creating Harry Potter, her "best friend" during the most difficult of times. 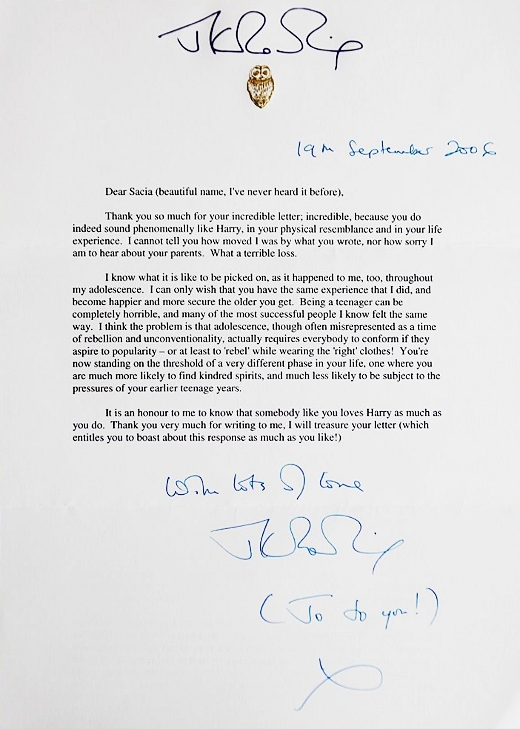 Her letter can be read below, followed by Rowling's lovely, encouraging response. I have so much I'd like to say, but I know you are a very busy woman so I'll try to keep it short and not take up too much of your time. Primarily, I would like to say I absolutely LOVE your books and have at least one copy of each on my book shelf, in addition to Harry's school books for Comic Relief and several analytical and biographical ones related to Harry and you. With that, I'll just go right into it. I first heard of the Harry Potter series when I was in fourth grade, but at the time I was not much of a reader. In the beginning of my fifth grade year, I went out on a whim and began Sorcerer's Stone; I was hooked by page three and have not been seen without a book on hand since. I have never enjoyed a series as much as I have every one of your Harry books. I noticed, as I read each of the six books the first time through, I was the same age as Harry, which was quite coincidental. I have cried at least once reading every one of the six so far (several times during a few) and out right bawled at the end of Half-Blood Prince. Losing Dumbledore, empathizing with Harry and his friends, seeing their heartache, and feeling as though I had lost a grandpa myself was utterly overwhelming. The relationship that evolved and grew between Harry and Dumbledore from the end of book five and throughout book six increased the intensity of this for me. This emotional reaction, I speculate, may perhaps be a result of the strong connection I feel with Harry. Not only do I wear glasses and have green eyes, thus sharing a bit of his physical appearance (I realize I speak of Harry as if he is a real person, but to me he is very real indeed, as I'm sure he is to you), but I'm also an orphan, both parents having been murdered when I was younger. In addition, I was always picked on before I went to my new school, as Harry was by Dudley and his cronies before he went to Hogwarts. So, I also have a strong emotional understanding with Harry and feel the severity of Harry's loss of Sirius (I bawled here as well); for these reasons Harry holds a special place in my heart and he always will. Being picked on most of my life, I never had many friends due to my own insecurities and fear of loss, but through the most difficult times in my life, Harry was my best friend when I needed him most and he lent me his world in which to escape my own grief and hurt, and for this I thank you from the deepest part of my heart. To me, it's like Harry and I grew up together. I have grown a lot emotionally over the years and am now sixteen (as is Harry). Thank you so very much for lending me your hero and his world. He is my hero, and you are my heroine. 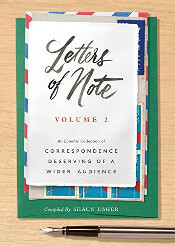 I do not expect a reply, as I know you are a very busy woman, mother, and wife, but I do hope you have a chance to read this letter (I understand you have a plethora of fan mail and there's only so many hours in the day). I do not wish for you to read this or reply so I can brag about making contact with a celebrity or something ridiculous of that nature; in fact, my family will probably not even know that I wrote to you. Mostly I just really wanted to express my deepest gratitude and appreciation to you and Harry. I needed for you to know how important he has been to me. 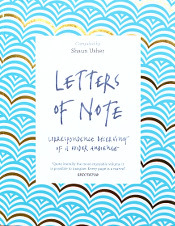 Thank you for your incredible letter; incredible, because you do indeed sound phenomenally like Harry Potter, in your physical resemblance and in your life experience. I cannot tell you how moved I was by what you wrote, nor how sorry I am to hear about your parents. What a terrible loss. I know what it is like to be picked on, as it happened to me, too, throughout my adolescence. I can only wish that you have the same experience that I did, and become happier and more secure the older you get. Being a teenager can be completely horrible, and many of the most successful people I know felt the same way. I think the problem is that adolescence, though often misrepresented as a time of rebellion and unconventionality, actually requires everybody to conform if they aspire to popularity - or at least to 'rebel' while wearing the 'right' clothes! You're now standing on the threshold of a very different phase in your life, one where you are much more likely to find kindred spirits, and much less likely to be subject to the pressures of your teenage years.